Happy Friday Eve friends! I cannot believe that Thanksgiving is a week from today! We’re in full on cooking mode over here. Planning appetizers and desserts and picking up ingredients is how we’re spending our weekend. You’ll find no complaints here since testing recipes is one of the best excuses for eating a ton of baked goods in my opinion. I’m excited to share an easy Thanksgiving outfit today if you’re headed somewhere a little more formal with this super chic herringbone coat! I’ve been getting a bunch of requests to feature some holiday looks, so I’m excited to start with this Thanksgiving one. Thanksgiving is one of those holidays where you either do dressy or casual – no in-between. This look is more on dressy side but could easily be dressed down with some flats. A long wool coat is an essential for us East coasters, and this herringbone coat is a great piece for winter. Classic, but still feminine, and it would be a great option with some heels if you’re headed somewhere dressier for your Thanksgiving meal! This one from Joules is so well made that I can’t wait to wear it more throughout the season. Let’s talk about these necklace layers! 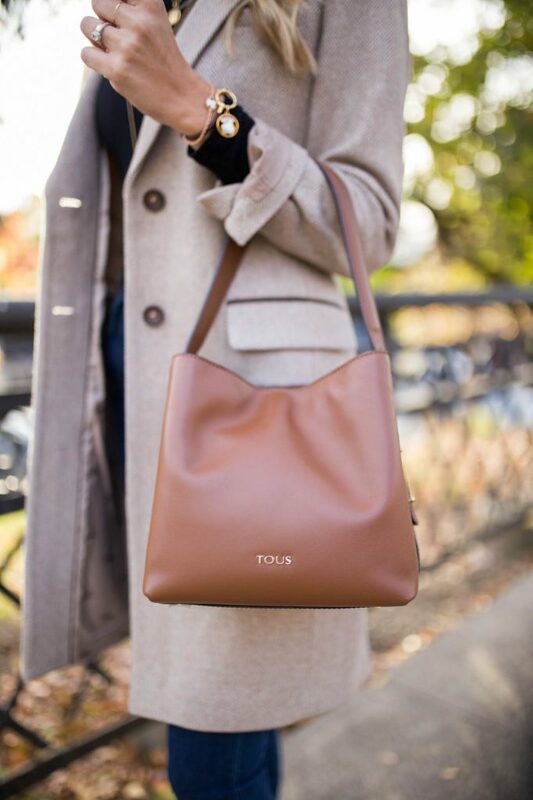 As I’ve mentioned before, TOUS is one of my go-to places to find beautiful dainty jewels that are perfect for layering. These TOUS Medallion pieces are adjustable – making it easier than ever to stack to get your perfect length and look. Also, how gorgeous is this bag? Buttery leather, great size and a cognac shade that will go with everything! Today’s post is in collaboration with TOUS! All opinions are my own.